As we age, our bodies change. One process we undergo is known as sarcopenia. It can start as early as age 30 and cause a 5% loss of muscle mass each decade. Unfortunately, even the most physically fit individuals aren’t immune to its effects. Make sure you consume the proper nutrients. As you grow older you’ll need more lean protein, anti-inflammatory foods (e.g. nuts, broccoli, spinach, blueberries), and calcium. Taking daily multivitamins will also help here. Drink plenty of water – one gallon for men and 3/4-gallon for women. Make sure you engage in proper workouts. When working out, you want to make sure you perform each exercise until you feel fatigued. Instead of the traditional three sets of ten model, you want to feel your muscles grow so tired you need to take a break before you can do more. To begin, maybe consider doing one set of ten to fifteen repetitions, when fifteen becomes easy, add a second set, when that becomes easy, add a third. When you can successfully perform three sets of fifteen, then add a small amount of weight, drop back down to three sets of ten reps and then gradually work back up to three sets of fifteen. Ten to Fifteen repetitions will allow you enough resistance and time under tension to get results. Lower rep ranges (3-6) may be better for gaining pure strength, but your risk of getting hurt with heavier weights is a very real possibility and the risk/reward ratio is unacceptable. Another added benefit of resistance training is bone mineral density. As you add resistance (load bearing exercise), you will also increase bone density along with increasing strength. In addition, by working out, you also keep the joints better lubricated aka motion is lotion. It’s also important to make sure your muscles have plenty of time to recover so you don’t overtrain. Build in rest days or alternate resistance and strength training workouts with cardio workouts. You can also engage in active recovery. This includes lower impact activities (e.g. walking, yoga, stretching). Another important note regarding your workouts is the importance of trying something new. Whether you simply mix up the types of workouts you do or you try different fitness classes, this will help you remain engaged without growing bored. This isn’t something that should make you feel anxious. There are so many resources available to help you with this today. For instance, there are fitness apps that can guide you through different types of exercises. You can also use Google to find free or low-cost activities that are being offered in your community. Besides possibly finding a new activity you may enjoy, you may also find some new, like-minded people you enjoy socializing with. Proper fitness and nutrition are the best ways to ward off the degenerative muscle loss that most people are faced with as they grow older. 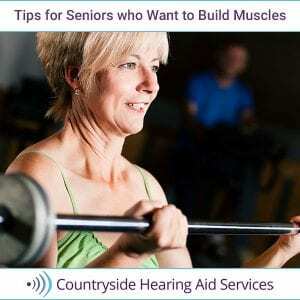 It’s also important to remember that as you age, your hearing can decline as well. This results in loud televisions and continually asking people to repeat themselves. Hearing loss is also very much connected to cognitive decline and memory loss. This too, can be helped. For more information about your hearing, contact Countryside Hearing Aid Services today at 727-796-1161. We have been serving Clearwater, Dunedin, Oldsmar, Palm Harbor, Safety Harbor and Tarpon Springs since 1979!